After all of the components of the home buying process — negotiations, appraisals, inspections, and insurance — it’s very exciting to (finally) get to closing. But do you know what really happens during this final appointment? Closing on a home can be nerve-racking simply because many first-time buyers don’t know what to expect or what to bring along. New Year’s Resolutions don’t just mean lifestyle changes, they can include buying a new home! Here are 5 financial resolutions that can help you reach your goal of buying a home in 2018. Over on Keeping Current Matters, we found this handy Infographic that is short and sweet. Double-Digit Growth in the Wild West: Is a Bubble Next? Demand is forcing home prices out West to keep ticking up, even though the home-buying and -selling season is winding down, according to the September Zillow® Real Estate Market Report. 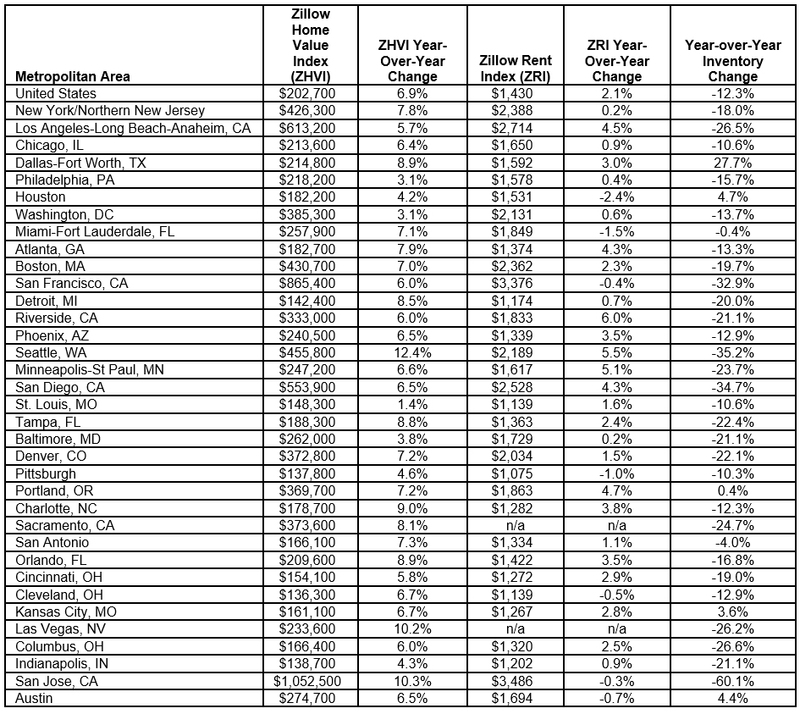 Appreciation is highest in the San Jose, Calif., and Seattle, Wash., metropolitan areas, where prices have rocketed (in order) 10.3 percent, to a median $1,052,500, and 12.4 percent, to a median $455,800, year-over-year. Appreciation nationally is 6.9 percent, to a median $202,700. Rents out West are also on a swift upswing. Rents in Riverside, Calif. have climbed 6.0 percent year-over-year—the most of the metro areas in the report—to a median $1,833. Rents in Seattle have gone up 5.5 percent to a median $2,189; rents in Portland, Ore., have increased 4.7 percent to a median $1,863; and rents in Los Angeles, Calif., have risen 4.5 percent to $2,714. Appreciation nationally is 2 percent, to a median $1,430. “In these West Coast markets, heightened demand is being met with limited supply of homes for sale, which naturally causes prices to rise,” says Dr. Svenja Gudell, chief economist at Zillow. “That limited supply and high demand dynamic is a widespread phenomenon impacting high-growth metros like Seattle, as well as slower-moving markets, like Indianapolis. “It might be easy to assume another bubble is emerging, with home values growing 10 or 12 percent per year, but don’t worry—the market is reacting to basic economic laws, and is behaving exactly the way we would expect it to given good overall growth, limited supply of homes for sale and decent housing affordability thanks to low mortgage interest rates,” Gudell says. Nationally, there are now 12 percent fewer homes for sale compared to one year ago, the report shows. article written by Suzanne De Vita, RISMedia’s online news editor. What’s that smell? The sense of smell is the strongest of all the senses to connect buyers to a home. While a bad smell can really deter buyers, a good smell can tempt buyers to a sale. From “green” scents to seasonal scents, discover the right smells for triggering positive emotions and home sales. Most of us associate “clean” with strongly scented cleaning products and disinfectants. It can even make buyers nostalgic. But remember, a little goes a long way. You should dilute your cleaning solutions so buyers don’t get overwhelmed. Using actual fruit is one way to get a clean smell without all the cleaning products. Lemon, orange and grapefruit scents are best. One great tip is to grind up lemon or orange rind with a few ice cubes in the garbage disposal. This will freshen up the kitchen, one of the most important rooms in the house. Sometimes the best scent is no scent at all. Try using “green” cleaning supplies, baking soda and other non-scented products that neutralize odors. The idea is that simpler is better, so you want to avoid complex, artificial smells from potpourri, sprays and plug-ins, which can actually distract buyers and turn them off. Nothing can make a house smell more like home than freshly baked goods, but be sure to stick to simple smells like vanilla, cinnamon and fresh bread. You don’t have to really bake anything. One trick is to boil some water and throw in a few cinnamon sticks an hour before a showing. Don’t we all love that fresh pine scent? Especially with the holidays around the corner, it’s a great scent to greet buyers when they walk in the door. If you don’t want to put up a live tree, you can simply hang a wreath of tree trimmings or some fresh garland. You can’t go wrong with setting a holiday mood to inspire a sale. Buying a house and moving in is gonna cost you. There’s no way around it. Right? Well, actually, there may just be a way to make it not quite so painful. A willingness to negotiate and put in a little work plus a little inside info on special deals you can take advantage of can help you cut some costs. Here are eight ways to save money on your move and move in. Furniture you’re no longer in love with or appliances like washers and dryers or the fridge you have in the garage can be a pain to move. You can potentially save money (and time and hassle) by including them in your home sale. First-time buyers or someone moving from out of state may appreciate your old stuff far more than you, and you don’t have to pay to haul it to your next place. If you have a mounted flat screen TV that’s at least a few years old, consider leaving it behind too. The cost of taking it down and repairing the wall behind it plus the care involved in moving it might not be worth it. Flat-screen technology is always improving while costs are coming down, so it’s a good excuse to buy something bigger and better without spending a lot. If you’ve been looking for a house or have bought one before, you’re probably already aware of closing costs. But you might not be aware of how much you can negotiate with your lender. “Shop around before choosing a mortgage lender, but don’t stop there,” said Bankrate. “When you receive your good faith estimate of closing costs, or GFE, the negotiation hasn’t ended.” This itemized list of estimated closing costs includes lender’s fees as well as items such as appraisal charges and title insurance premiums. Need a handyman and have appliances or furniture you’re getting rid of? You just might be able to make a deal. Ask around for referrals and then introduce a barter system into the equation during your first conversation. You might be surprised what you can get for what you’ve already got. Once you’re out of college, or maybe out of your first post-college apartment, thinking about renting a U-Haul and moving yourself (or with a few good friends) seems less than desirable. But if you’re willing to sweat a little (ok, a lot) you can save a bundle. Just remember two important things to entice and thank your friends: Pizza. And beer. Have everything on one floor. Stairs can add considerably to the cost of a move. Pare down. Maybe you don’t need to bring all that stuff with you. Selling it will earn you a few bucks and save you a few more. A company like PODS or U-Pack might be a solution for you if you need self storage wrapped into your move. Essentially, the company drops off a mobile storage unit at your house and you pack it up yourself. They then pick it up and move it for you. You can tack on storage at the end if needed, making this a particularly good solution for those who have time between their move out and their move in. This type of move can cost up to 35 percent less than traditional movers, but keep in mind you will be doing the labor – just not the driving. Move-in offers for cable, Internet, and phone service can save you a lot of money. But they often come with a catch that could cost you down the line. Look out for special limited-time offers – one-year or six-month specials that expire, leaving you with much higher rates after the introductory period. Chances are, after you move in, you’re going to start receiving all kinds of junk mail asking if you want to refi, redo your lawn, and apply for 72 different credit cards. In what seems like an endless pile of junk mail will be some special offers for new homebuyers, but they might not arrive for a month or more. Look out for coupons from handymen, companies selling flooring and window coverings, home furnishing companies like Bed Bath and Beyond and World Market, and offers from landscapers with discounts for new clients. If you’re planning to shop, renovate, or do some work on your interior or exterior, taking advantage of a few of these offers can help shave down the cost.